I’m taking a moment out from illustrating the Witches! graphic novel (still about 80 pages to go!) to talk about the Australian Horror Writers Association (AHWA). To put it plainly I wouldn’t be a published author/artist if it wasn’t for this organisation and this post is a way of trying to repay the debt. I joined the AHWA in 2009 and not long after, I secured a spot in that year’s mentor program with Brett McBean as my mentor. What I learned from Brett helped me find a publisher for my first novella “Torment”, but although the mentorship program ended long ago, the AHWA continues to assist me and hundreds of other horror authors on their journeys to publication. The AHWA’s strength comes from its connections. The authors all go out of their way to offer support, guidance and a critical eye. The old saying “it’s not what you know, but who you know” is the very definition of the AHWA. This leads me to the AHWA’s other strength – it’s dark fiction magazine Midnight Echo. The mag features fantastic fiction and art and my illustrations even graced the pages of issue 5 with the graphic story Allure of the Ancients in February this year. I’d submitted a graphic story for issue 4 and although I was knocked back in that instance, it was the then art director Dave Schembri who connected me with Allure’s writer Mark Farrugia and eventual publication in issue 5. 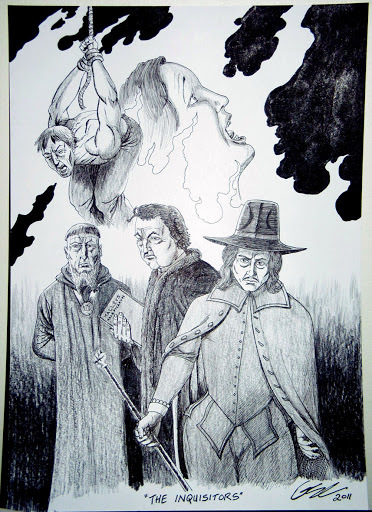 Allure attracted the attention of US Horror Writers Association president Rocky Wood who was looking for an artist for a new graphic novel project – and Witches! was born. So I guess it goes without saying that I owe a lot to the AHWA and all the people involved in it. For the past 18 months or so I’ve been in the role of media/PR guy for Midnight Echo magazine in an effort to repay the debt. The magazine just launched its new website: http://midnightecho.australianhorror.com and has started a major subscription drive with heaps of great prizes up for grabs. I encourage everyone to subscribe if you want to read some of the BEST horror fiction Australia has to offer. The AHWA, in conjunction with the Australian American Association is also in the midst of a fundraising campaign for Rocky, who was diagnosed with ALS/Lou Gerrig’s Disease, an illness that affects motor function. They are trying to raise funds to help Rocky buy an eye gaze device so he can continue to communicate. A Halloween Dinner Dance will be held in Melbourne on October 29 and will include an auction. I am donating two original pieces of art to the auction – one inspired by the Witches! 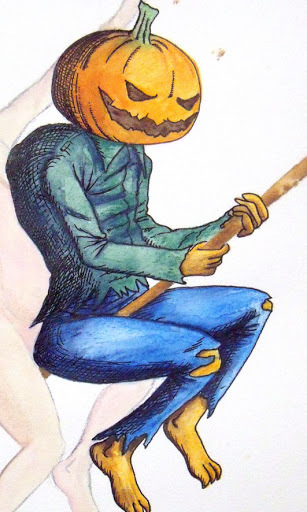 graphic novel I am working on with Rocky and a colour piece combining witchcraft and Halloween (in progress – detail below). More info on all the items for auction can be found HERE and you don’t have to attend to bid. Thanks for the kind words for the AHWA! Great to hear about the mentor program Geoff!